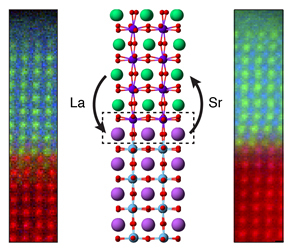 Chemical mapping and illustration of atomic rearrangement at the interface between two oxide materials (La = lanthanum; Sr = strontium). Image courtesy of PNNL Enlarge Image. Understanding how materials form and combine with one another is important to design better energy-harvesting and -storage devices. Now, researchers have directly imaged the loss of a single layer of atoms in a photocatalyst created by layering two oxides. The team examined the structure of a single layer and that of the final composite, finding that a plane of atoms right at the material boundary was lost during the synthesis process. The team showed that the starting material's surface is unstable and can dramatically reconfigure when combined with a second layer. "These unexpected findings open the door to a whole new way to control oxides," explains lead author Dr. Steven Spurgeon, Pacific Northwest National Laboratory. Why It Matters: Spurgeon and his colleagues at Pacific Northwest National Laboratory answered a strange riddle about the behavior of a material for using sunlight and water to create hydrogen. The material undergoes a dynamic rearrangement of atoms as it forms. This change can give rise to an unexpected interface structure and properties. With this understanding, scientists can design their synthesis methods to account for growth dynamics and the restructuring of atoms. The results could lead to more precise control of the properties and performance of key energy materials. Summary: Advances in synthesis and characterization have allowed scientists to fabricate materials in many different structures and chemistries at nearly the single atom level. However, it is still difficult to predict how two materials will interact, because many types of defects can form between them. Because the structure of materials directly controls their properties, it is important for scientists to be able to precisely tune how materials form and connect to each other. In this study, PNNL researchers examined thin film lanthanum iron oxide and strontium titanium oxide, LaFeO3 (LFO) and SrTiO3 (STO), respectively, layered together to produce a photocatalyst for solar water splitting. The researchers first treated the STO layer to cap it with either a strontium oxide (SrO) plane or a titanium dioxide (TiO2) plane, which they confirmed using X-ray photoelectron spectroscopy. They deposited an LFO layer atop the STO using molecular beam epitaxy and imaged the resulting structure using scanning transmission electron microscopy and electron energy loss spectroscopy. Strangely, their electron energy loss spectroscopy measurements showed that both samples had a TiO2 interface plane and that the SrO layer had gone missing during the synthesis process. 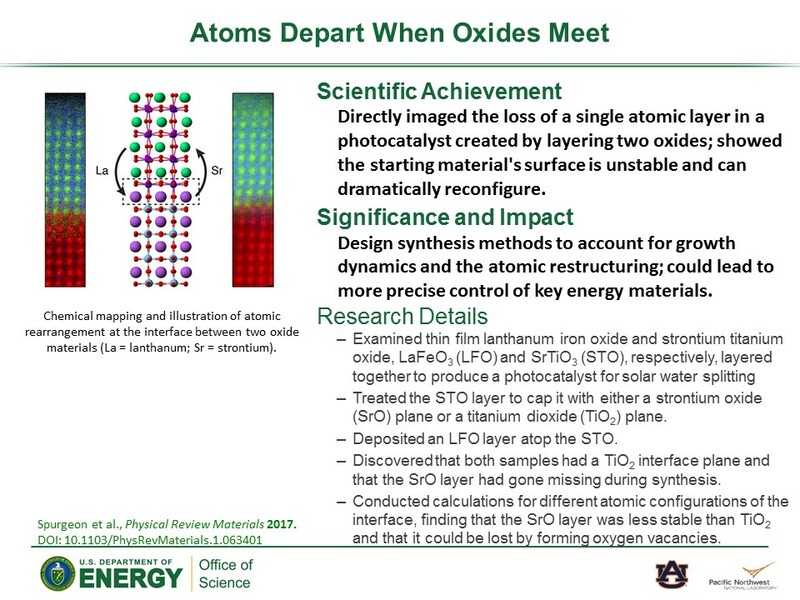 The researchers conducted density functional theory calculations for different atomic configurations of the interface, finding that the SrO layer was less stable than TiO2 and that it could be lost by forming oxygen vacancies. This study illustrates how materials form through complex kinetic pathways and that by harnessing dynamic structural rearrangement, it may be possible to craft new, never-before-seen materials and properties.